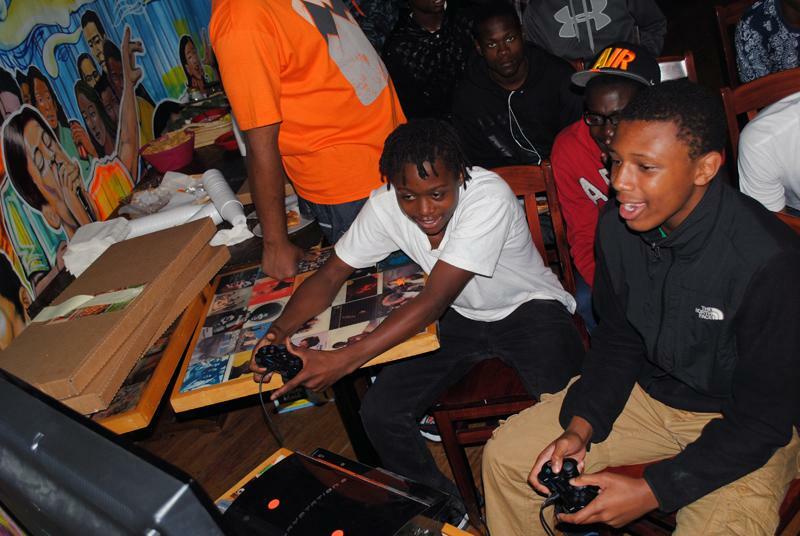 Young adults such as Damiean Walker (left) and Malik Jenkins competed for a cash prize in a video game tournament at Boocoo Cultural Center and Cafe, which was geared to provide job opportunities to Evanston youth. The shrieks of teenagers playing a newly released basketball video game filled Boocoo Cultural Center and Cafe in an event designed to keep Evanston youth off the streets Saturday. The youth group We Want To Live organized the event, in which 16 young people competed in an “NBA 2K14″ tournament for a $200 jackpot and business suit. Organizers also gave participants’ information to local employers, hoping to help them find jobs. Pizza and refreshments, provided by the city, lined a row of tables against a wall painted with a colorful mural. After providing background information in brief interviews, the teenagers picked numbers from a hat to decide the tournament matchups. Terry Spearman, a student at Maryville Academy in Des Plaines, Ill., said he was looking for a new job instead of stocking vending machines at his high school. He said the event kept him out of trouble, noting he had to leave ETHS because he was involved in a fight. “(If I got a job) I could provide myself with a better future. If I have kids, I can provide for them,” Spearman said. Bobby Burns, founder of We Want To Live, said he is trying to find job opportunities for participants through the Evanston Youth Job Center and Curt’s Cafe. To set up the event, the organization partnered with the city’s Youth and Young Adult Division, local businesses and the mayor, among others. Spreading word of the event involved a grassroots campaign, conducted mainly through word of mouth, Burns said. We Want To Live, which is in the process of becoming a nonprofit organization, started in 2009. The group hopes to shift attention away from isolated acts of violence and focus on positive aspects of community, Burns said. He added he does not want those incidents to define the 5th Ward. Burns’ organization has taught gardening to both young and old people on Chicago’s South Side. He said he hopes to organize youth-centered events in Evanston on a more regular basis and recruit volunteers from Northwestern. Burns, a student at Northeastern Illinois University, said his organization’s next project is an advertising campaign to continue the message of the tournament. Kevin Brown, manager of the Youth and Young Adults Division, said Burns’ project fits into the city’s goal of helping at-risk youth. Correction: A previous version of this article misstated Bobby Burns’ university and his status finding job opportunities for the tournament participants. The Daily regrets these errors.